Below are the particular installation details for two-handle WaterSense bathroom faucets from AquaSource. The instructions should also work for other AquaSource faucets, as well as top-mounted bathroom faucets from other manufacturers. There may be slightly different instructions for other faucet models, however. First, shut off the water supply to the old faucet. Disconnect the water supply tubes from the tailpieces on the faucet, using a basin wrench or channel-type pliers. If you will be replacing the pop-up drain as well, now is the time when the drain trap and old pop-up should be removed so they are out of the way. Next, install the new faucet body. From the top of the sink, put the faucet into place over the three faucet openings. To fasten the faucet into place, reach under the sink and install the lock nuts onto the two threaded tailpieces. Before completely tightening the lock nuts with a basin wrench, check to make sure that the faucet is centered and straight. Connect the water supply tubes to the faucet, using channel-type pliers. It is always better to change the water supply tubes when installing a new faucet unless the existing ones are fairly new. Attach the hot and cold water supply lines to the corresponding threaded tailpieces of the faucet. 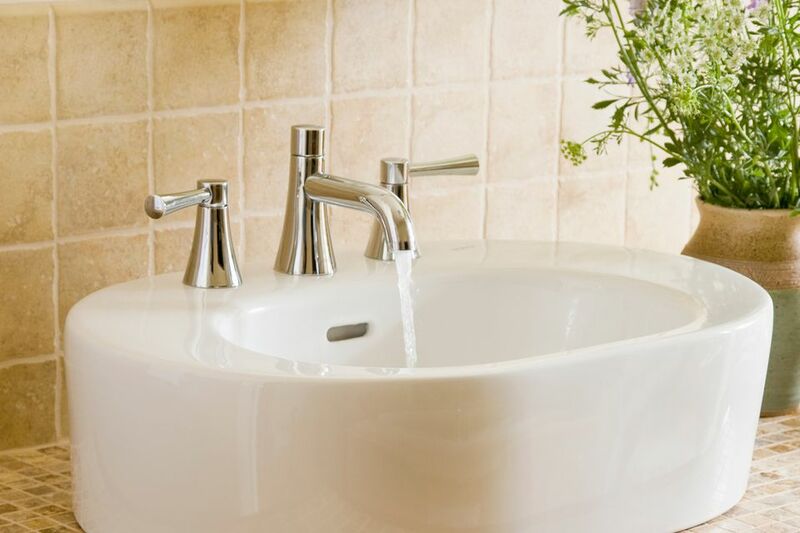 To tighten the water lines, it is a good idea to use two pliers so you can hold the shut-off valve or the faucet while tightening the supply tube connections. Be careful to not over-tighten when using pliers. To install the drain assembly, first, separate the pop-up drain components. Slip the rubber washer onto the pop-up body and drop the pop-up into the sink drain opening. Position the opening for the ball rod so that it faces back. From under the sink, slip the washer and nut onto the pop-up drain body and tighten. As you tighten, check to make sure that the pop-up is centered properly in the sink opening. The next step is to install the pop-up drain stopper. Insert the stopper into the drain. Under the sink, insert the ball rod into the pop-up drain opening and tighten the sleeve to keep it in place. To install the pop-up lift rod, start by inserting it into the faucet opening. Under the sink, attach the perforated strap to the lift rod. The button on the strap can be pushed into open and locks into place when released. Attach the ball rod to the lift rod after adjusting the height of the stopper. With the AquaSource faucet installation complete you can put the drain trap back into place and turn the water supply back on. Checking for leaks is the final step of any faucet installation. First, turn on both the hot and cold sides of the faucet and check for leaks under the sink. Allow the water to run for a couple of minutes, as some faucet leaks are not obvious right away. Use a flashlight to look around under the sink so you don’t miss small leaks.To check for leaks at the pop-up drain, lower the stopper and fill the sink up with water. Release the water and look under the sink for leaks around the drain.